Signature Flight Support is a global company with a office at the Chicago Executive Airport. 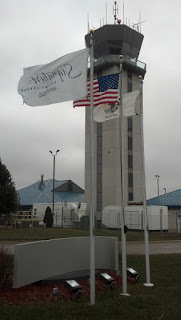 Signature Flight Support welcomes visitors with three very nice 25 foot flagpoles. While the flags might be out of order, the flagpoles have been cared for and look great. This company has raised almost $1 billion for Give Kids the World. They also sponsor and participate in several charities and community events. This is an example of a corporation which understands it "sells from the inside out." 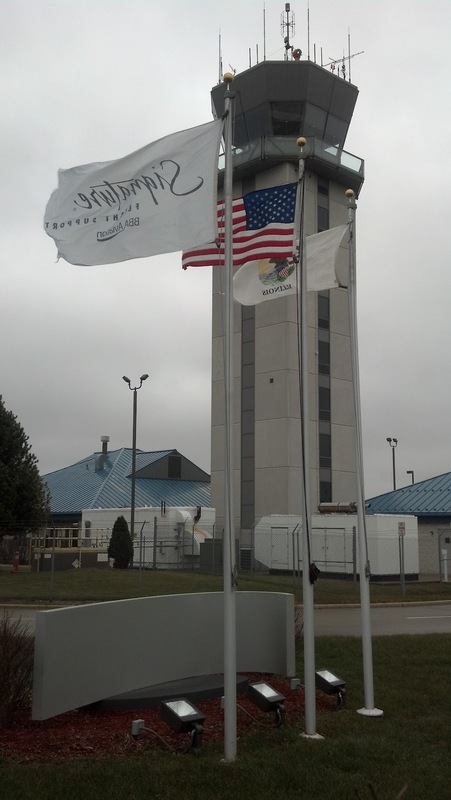 The custom Signature Flight Support flag at the entrance help employees and visitors know they've arrived. These 25 foot flagpoles are external halyard, single-stationary. This means the ropes are all on the outside of the pole. The truck pulley at the top is a cap-style truck and doesn't revolve. In an exposed area like the airport, a revolving truck is a great option. Even for a shorter pole such as these 25 footers. We'd also like to point out the nice lighting which is hidden behind the Signature business sign. Well done Signature Flight Support. Keep flying!